"The Mirage Man" should be required reading in every journalism school, and law school, in this country. It should be the textbook of a case study at the FBI Academy in Quantico, Va. -- and police academies everywhere. It should be taught in college government classes, and handed out to freshman members of Congress when they arrive in Washington, and to staffers assigned to the Capitol Hill committees and the White House National Security Council." "The Mirage Man is hard to put down and extremely well researched. ... It is a powerfully written book and a very engaging look at the Amerithrax investigation." "Willman starts the story with Ivins' childhood in small-town Ohio, deftly drawing the portrait of a disaster waiting to happen: Brilliant, awkward, given to strange obsessions, his passive father terrorized and even beaten by Ivins' tyrannical mother, trying too hard to fit in and succeeding only when his chameleon like personality convinced others that he was someone other than who he was." 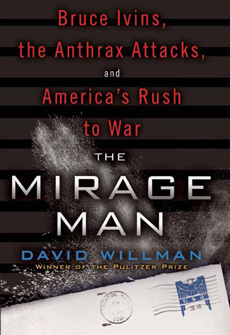 "Willman, a Pulitzer Prize–winning journalist, offers a nuanced account of the bungled FBI investigation into the "anthrax attacks" as the Bush administration strove to use the public panic to strengthen their case to go to war, while the culprit was, in all likelihood, a military microbiologist named Bruce Ivins. Willman traces Ivins's unhappy life, how he endured childhood abuse and privation to become a successful scientist only to find his life unraveling as a result of his bizarre obsessions and fixations with women--from co-workers to a reality TV star and members of a local campus sorority. Willman pivots to focus on the flawed investigation--how the FBI targeted terrorist groups and, later, the wrong scientist, Steven Hatfill--and how, perversely, Ivins benefited both financially and professionally from the public paranoia about anthrax as his research into an anthrax vaccine became a national priority. Willman makes the case against Ivins--and against the political uses of the case--with admirable fair-mindedness and narrative flair."